We do our very best to keep our program fees affordable. Therefore, our program relies on the support of parents, relatives, and friends who fundraise and purchase tickets to see performances. Unlike many other extracurricular activities, we do not make fundraising or ticket sales mandatory. However, we encourage you to please participate in some of our efforts to maintain the quality of work we produce for our students and your children. Rehearsal may sometimes run up to 15 minutes overtime. If your child was playing in a sports game, we doubt you would pull your child out of a game that had run into overtime. If possible, please allow us to finish working with your children. And hey, we won’t even charge you extra for the additional training time! Please remember to read weekly announcements, handouts, and emails carefully. You will find important updates and helpful information in these. We are sometimes required to change rehearsal times or facilities. We try very hard to keep you posted on changes and activities. If you have any questions, please call the local voicemail number or speak to a parent volunteer at any rehearsal. If you miss a rehearsal date where new information was distributed, it is your responsibility to get that information. You’ll always be told in advance when the new schedule dates will occur. It is our policy to allow parents to observe during registration so they may understand the program better. After that, rehearsals are closed to everyone but cast and staff. We understand you would like the opportunity to watch your child rehearse. However, after many years of doing this, we have found in our experience their focus and participation with us during rehearsal is much better without an eager audience. Older family members may enroll, train, sing, dance, and act with their children. The registration fee for parents is the same as for children. Several hundred parents have enjoyed this unique opportunity in our program. It is very important you bring your child, on time, to as many rehearsals as possible. It is difficult for the cast and staff when attendance is inconsistent or numerous people are absent. 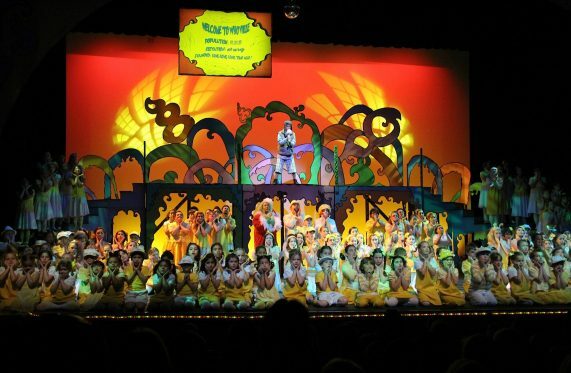 In many instances students rely on each other for their production numbers, whether they are learning a partner dance, have become accustomed to standing next to a particular person in line, or have to sing a vocal line together. Additionally, since we only rehearse once a week, each week we learn new material. It is a challenge to proceed with our lesson plans when many are absent. So unless absolutely necessary, we encourage you to attend all rehearsals. However, if your child is going to be absent, please email us or leave a message on our voicemail. We worry about you if you don’t show up!